Recent headlines have offered hope that President Bush may yet do right by the victims of Hurricane Katrina. After the first days of shameful ineptitude, he secured more than $60 billion in relief, named somebody with actual disaster experience to head the Federal Emergency Management Agency (fema), and, rather uncharacteristically, admitted his administration made serious errors in the storm's immediate aftermath. But there is one reason to think the Bush administration hasn't learned from its past mistakes: its plan for housing the people that Katrina has rendered homeless. Many of these people needed government housing assistance even before the storm hit. Many more will need it now, since they find themselves out of work, bereft of savings, and without a clue as to when they can return home. But the administration's emerging housing scheme repeats the sins of the government's initial hurricane response--from its contempt for effective government agencies to its utter lack of sophistication about the needs of Americans in poverty. According to the latest estimates, the government may need to provide homes for at least 200,000 households displaced by Katrina--an effort that would be unprecedented in scale but not in kind. Back in 1994, the Clinton administration faced a similar situation after the Northridge earthquake displaced more than 20,000 people in Southern California. It quickly dispatched Secretary of Housing and Urban Development (HUD) Henry Cisneros to Los Angeles and produced a proposal to offer the newly homeless emergency vouchers, which they could apply toward apartment rents. The initiative was modeled on an existing program called Section 8, a bipartisan favorite that breaks up concentrations of poverty by providing vouchers and support services to help low-income families move into neighborhoods with better jobs and schools. Soon, vouchers were getting into the hands of displaced residents, who in turn began finding apartments. While the operation was hardly seamless, more than 10,000 people used the vouchers. Many later said they ended up better off than they had been before the earthquake. ("This is the biggest break I've had in a long time," one voucher recipient told the Los Angeles Times.) Given the past success of Section 8 generally and the Northridge program specifically, it's no wonder that everybody from liberal members of Congress to conservative members of the blogosphere have suggested another emergency voucher program to help Katrina victims. This week, that enthusiasm propelled just such a proposal, sponsored by Senator Paul Sarbanes, to passage by the full Senate. But its fate in the House remains up in the air. And, so far, the administration seems decidedly uninterested in the idea. Fema currently has no plans to replicate the comprehensive voucher approach President Clinton rolled out after Northridge, according to spokesman James McIntyre. (HUD doesn't, either. In fact, while HUD has asked local housing authorities around the country to give displaced hurricane victims top priority for their existing voucher programs, it has provided the authorities with no new voucher money to accommodate the additional need, meaning the agencies will have to tap funds they had earmarked for local residents.) And what is fema's preferred strategy? It seems to involve mobile homes. Lots of them. While fema says it is scouring the Gulf region for apartments-- and will cover rent for people who find apartments on their own--its boldest move has been to order more than 100,000 mobile units, as an opening bid, which could theoretically house Katrina victims for as long as five years. Because it won't be feasible to locate that many units right in or near the devastated areas, fema contractors are now searching rural Louisiana and Mississippi for large tracts of unoccupied land where they could construct villages holding as many as 25,000 people each. These Katrinatowns would certainly represent an improvement over the Astrodome floor. But proposing to construct brand new communities with thousands of tightly packed mobile dwellings raises a lot of questions that fema doesn't seem prepared to answer, starting with the timing. 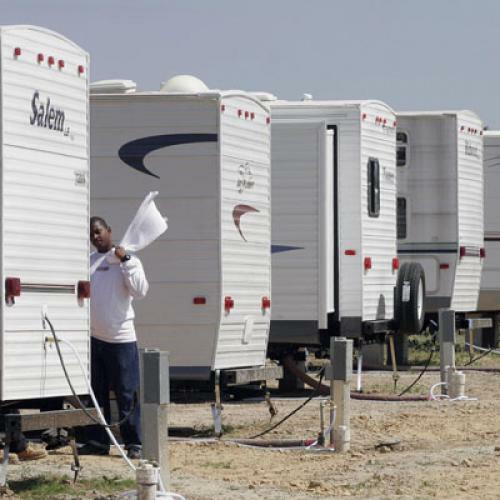 While fema hopes to move people out of shelters and into temporary dwellings (like cruise ships, motels, and existing mobile homes) at a rate of 30,000 every two weeks, it acknowledges that it will be many months, at least, before newly constructed mobile homes can accommodate such large numbers of hurricane refugees. After all, it took months just to build the 20,000 trailers for victims of last year's Florida hurricanes. And the Katrina construction will be far more complex, since it requires erecting physical and social infrastructure, from sewers and electricity to schools and grocery stores. Another problem this time around is the displaced population's special needs, from health care to counseling, particularly when you consider not only what these people have lost (homes, possessions, even loved ones) but the fact that their socioeconomic status meant many probably needed support services in the first place. Fema says it will work with the relevant government agencies to make sure displaced people get these services. But experts like the Urban Institute's Susan J. Popkin, who has studied public housing for 20 years, say the coordination between fema and agencies like HUD in the Gulf region today looks nothing like the tight cooperation that characterized the reaction to Northridge. Popkin worries that fema's planned housing will simply replicate the blight of New Orleans or create something even worse. "To quote one of my colleagues, 'The people displaced were people who were desperate on a good day, '" says Popkin. "Concentrating them in a situation where they have even fewer resources is really bad news." Granted, a Section 8-style voucher program would never work for everybody. (Even in Northridge, many residents had difficulty finding affordable apartments.) And many of those who opted for it would probably end up out of state, particularly with fema gobbling up what available apartments are left in Louisiana and Mississippi. But the Brookings Institution's Bruce Katz, who was chief of staff to Cisneros, says that, with government assistance, 100,000 people could find affordable apartments--not to mention economic opportunity-- in areas that don't have the tight rental markets of, say, Boston or San Francisco. And, with vouchers, these people could start rebuilding their lives right away rather than spend two or three years waiting in government-built trailer parks. "Think of a displaced renter with a couple of kids," says Katz. "How do you get those kids into a stable environment for the coming school year and next school year? Live in a trailer? Live in a motel? It makes so much more sense to get them into stable rental housing." It does--unless you have the instincts of the Bush administration. After all, the Clinton administration embraced the voucher scheme after Northridge because, when it needed to design and implement an emergency housing plan, it immediately looked to HUD--a department it had packed with capable, experienced policy hands and whose ideas (like Section 8) it was accustomed to taking seriously. But the Bush administration has tried to shrink HUD's budget and stature. It has also tried to gut Section 8, the program's bipartisan history notwithstanding. So, while the pressing human crisis of Katrina (not to mention the political backlash at the bungled federal response) has forced the administration to spend lavishly on hurricane relief, it has instinctively looked away from government and toward private firms like the Shaw Group, which won a no-bid contract to construct mobile homes. (Shaw's lobbyist, in case you hadn't heard, is Joe Allbaugh, the former fema director and Bush campaign manager.) The administration has gone this route despite the fact that the mobile homes might well cost more than the vouchers (fema says it doesn't have good figures yet). But this, too, isn't as surprising as it might sound at first blush. Finding the most cost-effective and expedient way to deliver housing to Katrina victims would suggest that the administration has thought seriously about how government might best help the neediest Americans. And, as we've seen all too frequently this past month, that's not a question the Bush administration ponders too intensely.